•Versatility- Sunshine enamels can be used on a large array of surfaces including glass, metals, & porcelain and work well with mostly all glass including Bullseye & Spectrum. •Easy to Use- Just mix the dry powder with an "enamel binder." 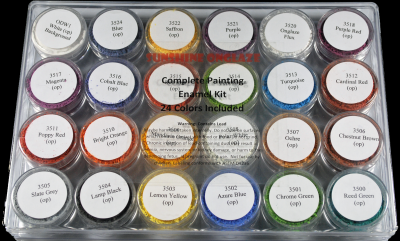 Sunshine enamels can be used like watercolors, acrylic, oil or in screen printing applications. •Create Additional Colors- In addition to the 22 colors we offer, you can mix up to 20 more or create your own! Sunshine Enamel Colors Click Here! Sunshine Enamel Mixers Click Here! Sunshine Tech Specs Click Here! Want to learn more about painting with enamel? Gillie Hoyte Byrom has created a series of instructional ecourses, whether you are a beginner, novice, or expert, Gillie's painting enamel ecourses are easy to follow, and provide step by step instructions covering a comprehensive array of topics. The only instruction better than the ecourses is taking one of Gillie's workshops in person!!! For more information on the ecourses please visit Gillie's ecourses. Check out Gillie's amazing protrait miniatures.